Her babies were diagnosed with twin-to-twin transfusion syndrome. 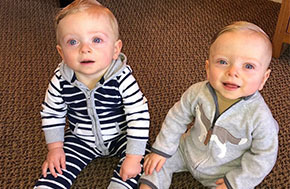 One twin was getting too much blood flow and the other not enough, putting both of their lives in jeopardy. Their only hope was a groundbreaking laser procedure performed in utero. Offered at only a handful of hospitals across the nation, this surgery would separate the babies’ blood flow to give them more time to develop and grow before birth. After the procedure, the next three days in the hospital became a journey filled with anxiety. 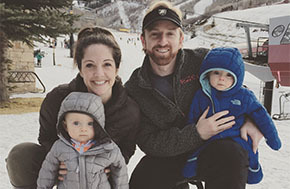 "We would painstakingly wait every morning to be wheeled into the ultrasound room to see if there were still two little heartbeats," Kristi said. Thankfully, day after day, sonograms showed both boys moving and kicking away. The surgery was a success. "After preparing ourselves for the worst, Matt and I couldn’t believe it. Texas Children’s saved our boys." 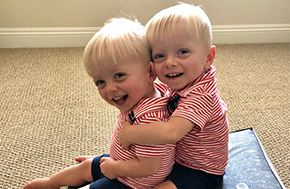 For Matt and Kristi, that day came when their twin boys, Rhett and Rhys, were delivered safely at 4 pounds, 7 ounces and 3 pounds, 6 ounces, respectively. Today, the twins are almost 2 years old. "We wouldn’t have managed without faith, family support and our loving medical team who steered us through the entire process," Kristi said. "We are grateful for every person who touched and enriched our lives at Texas Children’s."